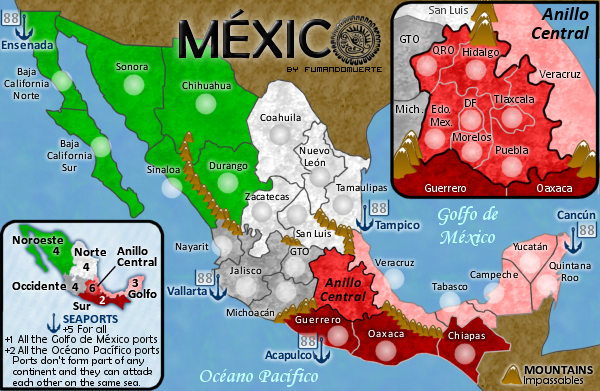 Gameplay: A map based on the actual political division of México with some important ports on both international waters. No new elements are added to the classical risk gameplay. Here are the (hopefully) final images! I've added some (more) texture to the coastline, darkened the border lines, and added a new texture to the land (which I still feel ambiguous about, but could live with this one). Do people prefer this version or the previous version? natty_dread wrote: This is just me, but I wouldn't mind seeing a little bit of texture on the land. He had texture on there earlier but had decided to remove it. Yep - nothing quite looked right, and I like the contrast between the land and the water. RedBaron0 wrote: and the small map. Here's another quick update. I've made some minor tweaks to colours and some name placements. The sea names are now in Spanish too. I've played around with the colour scheme a little bit, and am happy with it the way it was originally (with some minor tweaks to the paler central regions). The mountains have been redrawn, and I'm actually quite happy with them, which makes a change for me - I've also filled in the gaps so it's much more obvious where the impassables actually are. The only obvious thing I can see that I still need to finalise is the minimap... unless anybody else can tell me otherwise? I've taken on board most of the suggestions; I've opened up the mountains between San Luis and Tamaulipas to make that area not so linear. The mountains between Michoacan and Edo. Mex. have similarly been removed to open up the Central region a little more. I've removed the Baja +1 bonus, and bumped Noroeste back up to 4, although I could be persuaded to drop it back down to three as it feels like it should be 3.5! Graphically, I've made the central area more yellow, and to be honest I preferred it red. The Eagle on the Mexico flag is much more brown than yellow, but brown looked even worse (and too similar to the unplayable areas). I've taken off the texture from the land, and actually like the sleek modern look it gives the map. As for the port icons, I really don't want to switch to an anchor; the icon I've designed doubles up really nicely as an army circle, and (in my opinion) fits the map quite nicely. I've had another look at the bonus regions, and think the map works slightly better with two in the middle. With that in mind, I've added in some more impassable mountains in sensible places, and tweaked some of the bonus values. Thoughts? 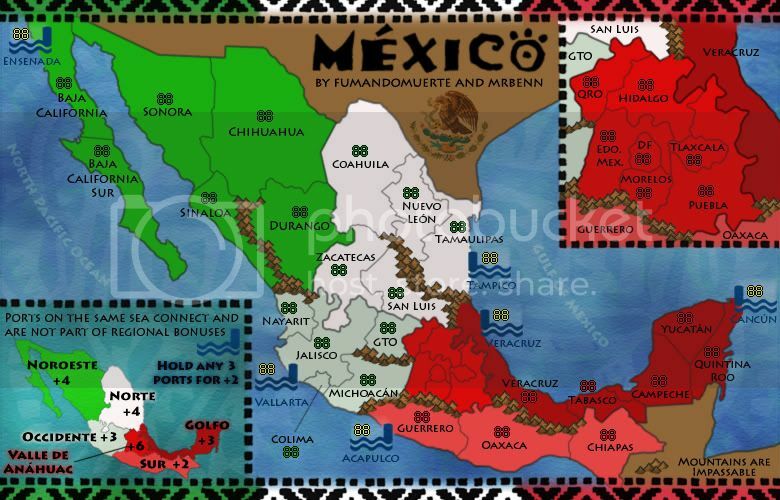 The borders have more of a Mexican/Aztec feel to them now, and I've incorporated the colours from the national flag too. I've extended some of the mountain ranges towards the middle of the map, and have redrawn the Ports/Docks; I've tried to create a motif that vaguely fits the theme, but is distinctly port-esque. 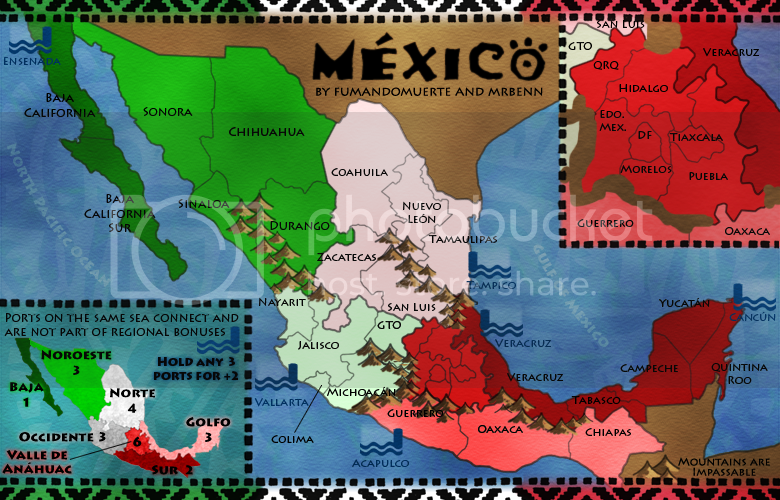 -The borders and Anillo Centro inset need to be redrawn; to make it more clear what goes where. -Once the location of the mountains has been confirmed, they need to be redrawn to. -It would be nice to add a third port on the West side to balance out the ports bonus. Here's my first update... I've resized to work on the large image first. Several of the layers had been flattened from fumandomuerte's working image, and I think he was using different software in any case. The text layers were all rasterised, so I've taken the liberty of changing the font (it was very blurry when I resized it). I've added something of a traditional Mexican art feeling to the map by adding a border and and a motif to the sea texture. I think the sea now helps to lift the map a little. I've moved the inset and minimap around, but still have a bit of work to do to get them up to scratch. Likewise, the mountains will need a bit of a revamp too. A map based on the actual political division of México with some important ports on both international waters. No new elements are added to the classical risk gameplay. -Changed the bonus for the Anillo Central region from 5 to 6. -Translated the sea names to the spanish form. -Added some texture to the land. -A little touch-up to some graphic elements like the terits names. -The neutrals are shown (ports). Is the gameplay OK or should I make a major change? 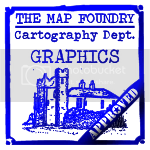 Have fun and keep coming to the map foundry, Vladi (fumandomuerte). -Added a mini-map for the bonuses. -Brought back the "Anillo Central" zoom with detailed borders. Seaports and anillo central start neutral. -Merged Colima, Aguascalientes (AGS.) 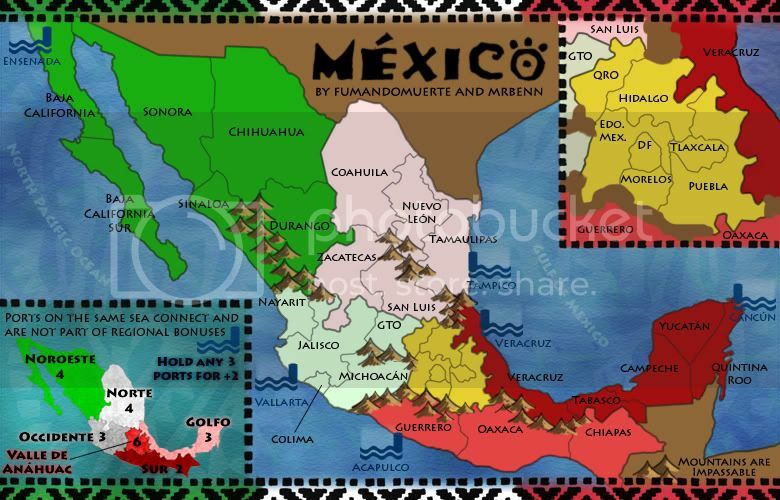 & Jalisco into one territory named Jalisco. -Made more legible territory names. -Changed some graphical aspects such as the armies containers, the bonus frame and other stuff. -Added a little mountain system to the border between Zacatecas-Guanajuato (GTO)-San Luis Potosi (SLP)-Jalisco to make easy to see who attacks who. -Anillo central start neutral and with some extra defense (maybe 6). -Got the XML, but lets wait more opinions and suggestions . Last edited by MrBenn on Mon May 04, 2009 5:38 pm, edited 15 times in total. "Bullets kill, grenades kill, bayonets kill, the cold kills. Death has a thousand faces. The worst of them all: the Court Martial." I knew something was wrong. Thanks for the note man. Can some administrator delete this topic? 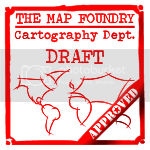 I've already published it on the Map Ideas area. I don't like that red continent that you blew up. I think you should merge some territories within it so you don't need an expanded version. Everything is just too hectic as it is. I thin kyou have a good start. But I agree with ink. The red part does crowd it. I don't like that effect you have inside the army circles right now. With the dot in the center that fades out. The dashed line from GTO. to Queretaro is awkward as is the Puebla to Oaxaca line. Maybe you could consider connecting them with a symbol instead. It might be a pain but you could make the map a bit taller and extend the legend down to explain this. I'll give feedback on what I think the continent bonuses should be later. Also you get the [Adv. Topic] tag, this means I think people should look at your topic and give it more attention than other topics in this sea of suggestions. InkL0sed wrote: I don't like that red continent that you blew up. I think you should merge some territories within it so you don't need an expanded version. Everything is just too hectic as it is. I actually think that the blown up central region would make for some nice stratagies. Besides, I wouldn't seem right if the area around the capital wasn't it's own territory. 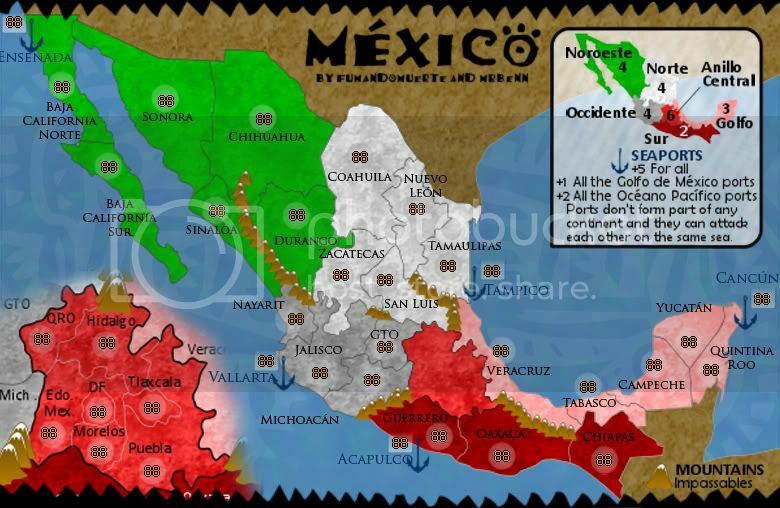 Mabey you could make mexico city worth one on its own and get rid of the red. 1. Since you explained that ports connect to each other on the same ocean, you do not need to have the dashed lines showing the connection. 2. I might be alone on this, but I don't think you need the dashed lines from to show where the larger image of centro connects to the smaller one. Maybe downsize it a bit and put it inside a box. That way it can be put more into the corner. At the moment all the dashed lines are very distracting. 3. Could you give those mountains another go? At the moment they do not look quite like mountains. Are there any rivers that could serve as impassable areas? 4. The legend in the bottom left seems quite weird. I don't understand why there is all sorts of brown underneath serving as the background. The shape is quite strange as well. Something more symmetric/square-like would probably be better. I think you have a bit of space that you could add to the bottom of the map. 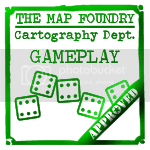 Though Maybe this would add more dead space that would detract from the overall image of the map. Great map. I love the look and the enlarged red region is great. similar to the Iraq map. I think that the map could be a little taller to allow for a better looking legend. But the small map is what will setup the layout. I would suggest setting up the small map first and figure out how to get everything you want. After that is done, the large map is basically finished. I insist, apologize my english . 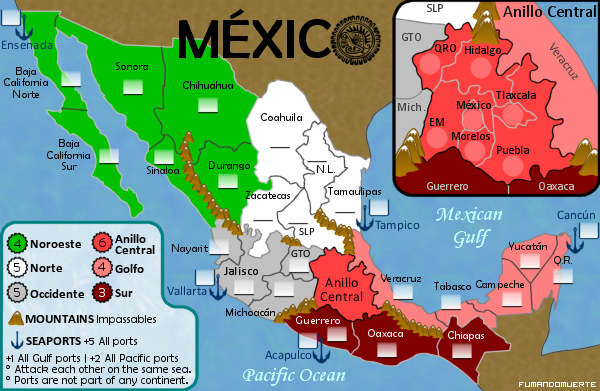 a) Merged the "Centro" continent to one territory ('Anillo Central' or 'Central Ring'), wich will play a more important role since it will give an extra bonus of +2. It will be attacked by 6 surrounding territories and 4 Airports. That corresponds to the Mexican Chaotic Centralism. It will start as a neutral zone with an amount of armies not yet defined (>=6 I was thinking). 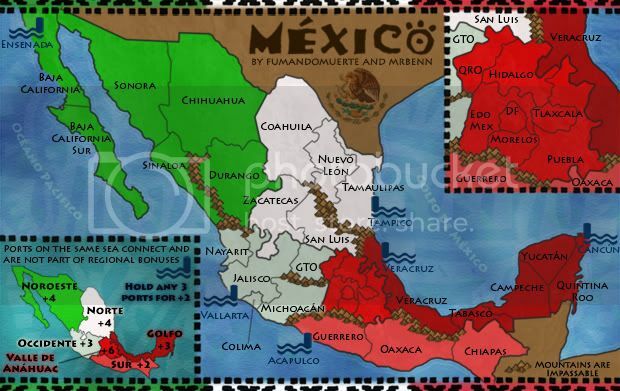 b) Removed Colima and Aguascalientes (AGS.) because of their size. 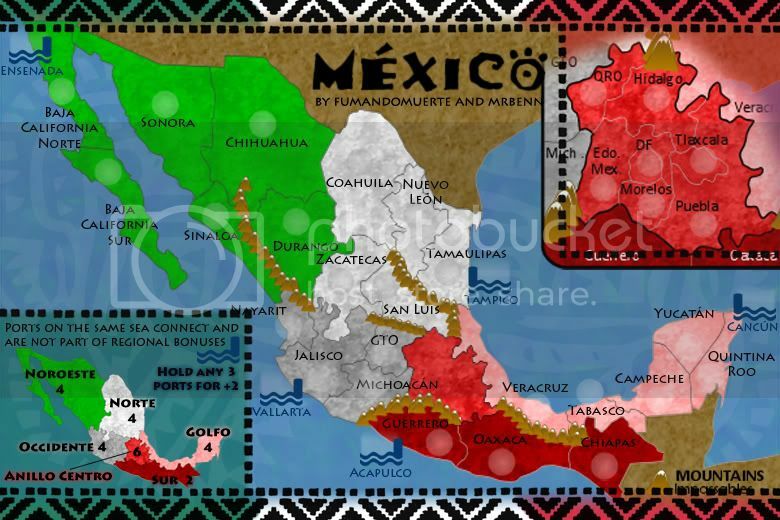 -Added the main 5 International Mexican Airports to their respective territories. -Ports doesn't start as neutral. 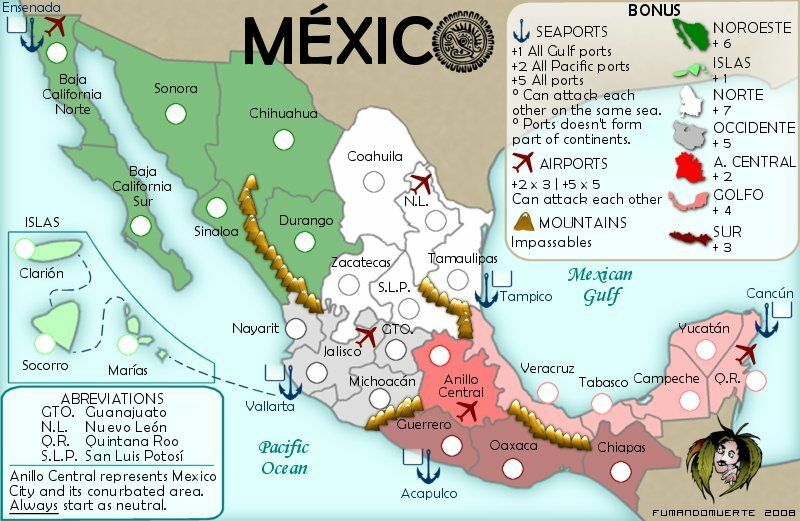 -Removed the innecesary sea routs between Ensenada-Vallarta-Acapulco-Tampico-Cancún. -The apparience of the Bonus menu. -Added the containers for the ports armies. I like the map with this number o territories, but if someone has any good idea of how to increment the territories with some properly extra lands its wellcome. I'm not too fond of having airports in the map but that's just a personal preference so don't pay too much attention unless you get a lot of people telling you they don't like them either. Many of the territory names are a bit hard to read because they cross over borders. I'd suggest trying out different fonts and boldness to see if that makes the words more clear. The text problem also affects the border at GTO and SLP. It looks like a 4-way border. You don't want those because we don't know if you can attack across the corners. So, either an impassable at the center or changing the borders slightly can clear this up. Next to Puerto Vallarta there's a small territory which has no name or army circle. I'm assuming this is just an issue with how you drew the border? 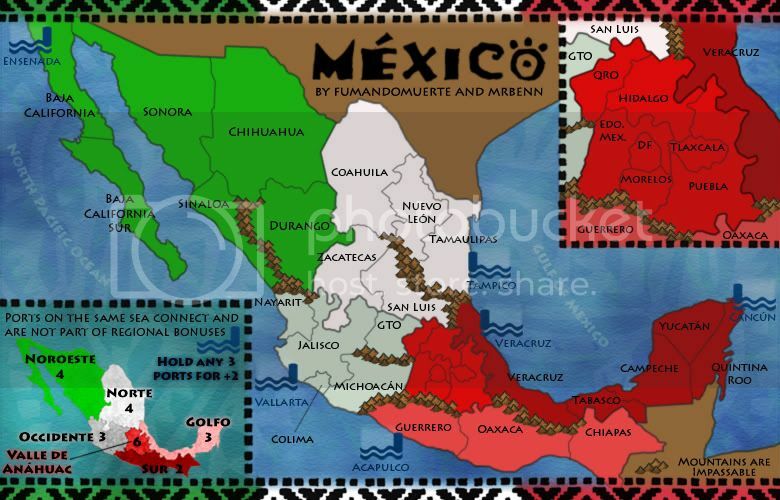 Can you change that border between Coahuila and Tamaulipas? What I mean is, the tiny stretch of NL that goes in between them could confuse people into thinking there's actually a border between Coa-Tam. I did like the Anillo Central before when it was quite a few territories, but the way you've made it now works well too. I think the advantage of this layout is that it gives you more space for other things like the legend. Thanks for the comments, I made some changes based on them . I did like the anillo central unmerged, but it could be a problem during the game causing some confussion. I added the airports to connect all with Anillo Central, as if it was the real wolrd... Centralism. Thanks to the CC staff for the perma-ban on ۩░▒▓₪№™℮₪▓▒░۩! 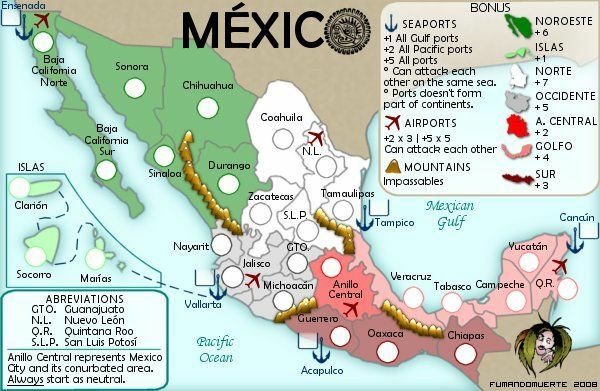 I really like the bonuses for the ports, especially the pacific and Gulf ports, i agree with edbeard that the airports need to be removed, if not removed then change the symbol, they look a lttle cramped. I really like the map overall though. Guys I am intentionally lurking. Discuss; Play mafia, it is good. Oderint Dum Metuant says: Don't confuse the easily confused! this map looks great, but i like the original version, with the df and expanded six-territory anillo central, even more. mexico is a very centralised country and we need the large area around mexico city to show how important the capital city is. this means a lot of the action will be in the mexico city area, just like real life. bring back the expanded anillo central! don't worry about confusing people because some maps use this technique already, for example bamboo jack. where to put anillo central? delete the three islas (and move the abbreviations). having no native population, the islas are of no importance. where it says "ports doesnt form parts of continents", it should say "ports are not part of any continent". With Anillo Central, does QRO attack SLP and GTO and Mich? And all that other territories that border other territories? KraphtOne wrote: when you sign up a new account one of the check boxes should be "do you want to foe colton24 (it is highly recommended) "
Skittles! wrote: With Anillo Central, does QRO attack SLP and GTO and Mich? And all that other territories that border other territories? I think it's very clear that QRO attacks SLP, GTO, Mich. (Michoacán), Hidalgo and EM. I don't understand the second question, can u be more specific? Ahkay, that answers my question. I was just wondering because I wanted clarification. thanks. it's look pretty good. I love the new update. I think this map is ready for the main foundry. I think your bonuses are a bit too high in a few places. the rest I think are probably fine.